People who hear you talking will remember you and later recommend you to their friends if they hear the same myths from them. 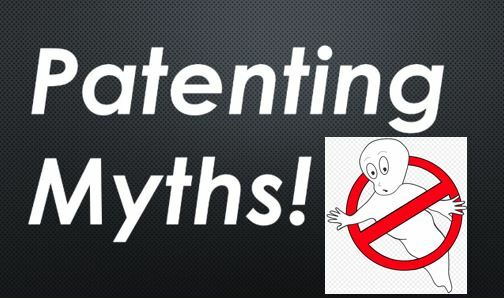 There are quite a few myths about patents that are not going away easy. My point is that each situation needs to be evaluated carefully and these blanket always/never type absolute statements that inventors might read about are misleading. 5) Any discussions that suggest a “quick and dirty” provisional patent filing provides protection for an idea. The application must meet all of the requirements of a non-provisional patent except the claims in order to afford protection. 7) Any suggestion that keeping a laboratory notebook or documenting the conception date of your invention will beat out someone that files the patent first. This MYTH is prevalent because, until 2013, it was true because the U.S. was on a “first to invent” system but in 2013 the U.S. switched to a strict “first to file” system. There are a bunch more misconceptions but the above are the most common that immediately come to mind. This group is where I, and an entire supportive inventor community, bust patent myths. For example, a former legislative consultant describing patents as state mandated permits to practice the disclosed invention (it’s a NEGATIVE right, dummy, not a POSITIVE one) or a privacy advocate arguing that patents stifle innovation while relying on Gillette’s enormous portfolio going back to their first commercial razor which, if anything, demonstrates the exact opposite.